Be the first to share your favorite memory, photo or story of Adelino. This memorial page is dedicated for family, friends and future generations to celebrate the life of their loved one. 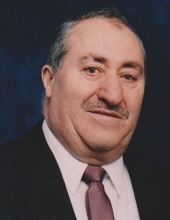 Adelino Marques das Neves, 89, passed away peacefully at his home in Kearny, NJ, on Saturday, January 12, 2019 with his loving family by his side. Adelino was born in Gafanha da Nazare, Portugal and came to the US in June 19, 1971 and resided in the Ironbound Section of Newark before moving to Kearny in 1975. Adelino was a Maintenance Mechanic for Adco Chemical Co. in Newark for many years. Beloved husband of 64 years of Zaida da Flores (nee Sousa) Neves; devoted and loving father of Adelino Sousa Neves and his wife Maria do Ceu Cirne, Pedro (Peter) Manuel Neves and his wife Cathy, Dora Maria Neves Delano and her husband Gregory and the late Antonio de Sousa Neves; dear brother of Floriano Marques das Neves, Luciano Marques das Neves and the late Floriantino Vieira, Armando Vieira, Manuel Jose Vieira and Ismael Vieira; cherished grandfather of William Cirne Neves and his wife Alexandra, Brittany Neves Farnish and her husband Joseph, Nicholas Neves, Austin Neves, Daniel Neves Delano and Dana Neves Delano. The Memorial Mass for Adelino will be held on Friday, January 18, 2019 at 10:00 AM at St. Cecilia’s Church, Kearny, NJ. Entombment Holy Cross Chapel Mausoleum, North Arlington, NJ. Relatives and friends are welcome to attend. Services conducted by Shaw-Buyus Funeral Home at 138 Davis Ave. Kearny, NJ. In lieu of flowers, donations to your favorite charity will be graciously appreciated. To send flowers or a remembrance gift to the family of Adelino Marques Neves, please visit our Tribute Store. "Email Address" would like to share the life celebration of Adelino Marques Neves. Click on the "link" to go to share a favorite memory or leave a condolence message for the family.